Three Billboards Outside Ebbing, Missouri, 2017. Written and Directed by Martin McDonagh. Starring Frances McDormand, Woody Harrelson, Sam Rockwell, Peter Dinklage, Abbie Cornish, John Hawkes, Samara Weaving, Caleb Landry Jones, Lucas Hedges, Zeljko Ivanek, and Clarke Peters. Distraught at the lack of development in her daughter’s murder case after seven months, Mildred Hayes resorts to renting out three billboards on the outskirts of town in order to catch the attention of local law enforcement. 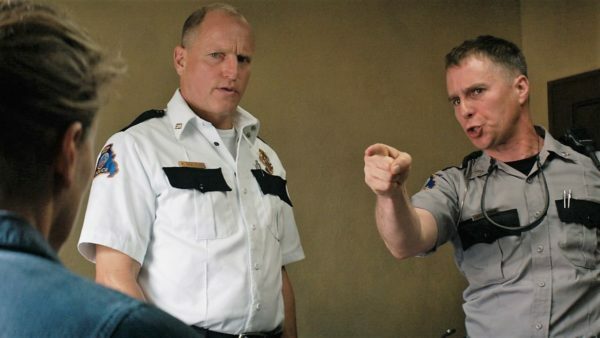 Diving back into the mind of Academy Award-winning writer/director Martin McDonagh (In Bruges, Seven Psychopaths), Three Billboards Outside Ebbing, Missouri is a film quite unlike anything you’ve seen before – which, if you’re familiar with McDonagh’s off-beat cinema, is exactly what you expect. His savage script and relatable characters create a scenario that is at once both bizarre and totally understandable in its irrationalism. Frances McDormand dominates as a mother, raw with both grief and rage over the murder of her daughter and the apparent farcical uselessness of local law enforcement. The billboards are the only way she can see to focus minds back on the case. The full brilliance of her character, however, lies in her refusal to be a victim: to get answers, she will kick you in the crotch, drill a hole through your thumb and/or set the police station on fire. McDormand’s bravura performance and McDonagh’s skilful writing meld together so seamlessly that none of these reactions seem in the least bit unthinkable. Three Billboards boasts both an exceptional cast (with several McDonagh regulars) and exceptional casting. Returners Woody Harrelson and Sam Rockwell are a brilliant police double act as Chief Willoughby and Officer Dixon, respectively. Harrelson is amiable as ever as the person with whom the buck stops (which the billboards make perfectly clear) – he may not be the most effective policeman, but he’s hurt by Mildred Hayes’ anger and disappointment. Rockwell is even more ineffective as Dixon is a small-minded, idiot cop, but it’s a role where he really shines. The central trio are marvellous, but the rest of the cast are equally adept – it just happens that the story focuses and unfolds around McDormand, Harrelson and Rockwell. The genius of McDonagh’s script (and the actors) is that every character is nuanced and fleshed out, regardless of their time on screen, from Red (Caleb Landry Jones) and Pamela (Kerry Condon) working in the (until now) uneventful advertising offices, to James (Peter Dinklage) searching Ebbing for love, and Mildred’s son Robbie (Lucas Hedges), trapped by his mother’s obsession with the past – but also a real chip off the old block. You can easily imagine each and every one of them continuing with their own storylines separate to the film’s central plot. 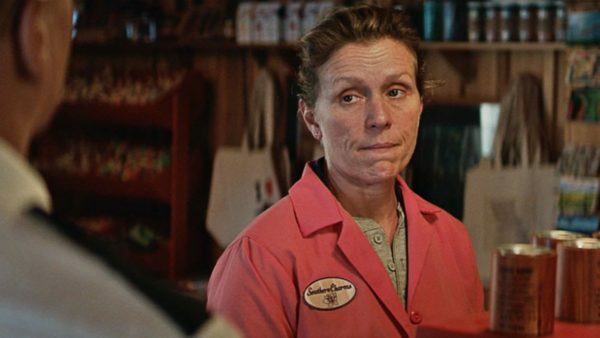 One of the real joys of Three Billboards is that, despite its dark tone and twisted tendencies, the town is filled with very believable, sympathetic people. Their awareness (or lack thereof) is entertaining, and it always comes from relatable – and deliciously enjoyable – places: the ex-husband (John Hawkes) with a stupid, young girlfriend (of whose limits he’s painfully aware) preaching calm before attempting to strangle Mildred, the priest lecturing Mildred on her non-attendance at church since the murder of her only daughter breeding a lack of awareness of Ebbing’s community, and the dentist who tries to follow suit (see thumb reference above). McDonagh’s dialogue throughout the film is tack sharp, with no wasted words or directionless conversation. 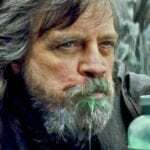 Profanity-soaked it may be, but these additions aid the characters’ lines in their rhythm and drive and anger – as well as the audience’s entertainment. His background in theatre is evident. The truth of each character and their situation is the real McDonagh magic – you know these people, these circumstances – and nothing is ever played for a laugh. Even if situations are heightened, they’re never too far-fetched. It’s a fine balance of the unbalanced. 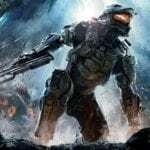 The cleverness of the film’s script allows for characters to react viscerally (and in most cases, very satisfyingly) to their circumstances, without ever losing its sharpness or direction. Three Billboards is a pithy, imaginative film, filled with excellent performances. Most thrillingly, it’s utterly original, and continues to attract awards, nominations and attention. McDonagh’s latest is – even this early on – shaping up to be the film of the year.